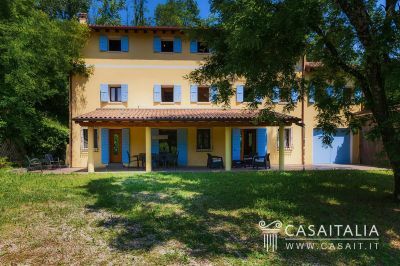 Country house in a panoramic location among the DOCG Prosecco vineyards just 15 km from Conegliano. Measures around 333 sq.m in total with large living area, four bedrooms, two bathrooms, laundry, games room, large room used as another bedroom, cellar and garage. Around 1.5 hectares of private land. Nestling amongst the green hills of Refrontolo, in the heart of the DOCG Prosecco producing area, this wonderful farmhouse has a view of the surrounding vineyards. The location is secluded and panoramic, around twenty minutes’ drive from the picturesque cities of Conegliano (15 km) and Vittorio Veneto (15 km), and about an hour from almost all the main cities in the Veneto, such as Treviso (38 km), Belluno (52 km) and Venice (75 km). Canova di Treviso airport, 40 km away, provides access to all the key destinations around Europe while Venice Marco Polo airport (65 km) offers access to almost all intercontinental flights. The location is ideal for day trips to important tourist destinations, as you can reach some of the best ski (Cortina d'Ampezzo 104 km), and beach (Jesolo a 74 km) resorts in a short time. - On the ground floor, there is a spacious living area with dining room and living room, both with direct access to a pretty veranda, then the kitchen and a guest bathroom for the living area. There is also a garage on this floor. - The first floor, accessible via an internal wooden staircase, comprises four bedrooms, three double and one twin and a bathroom with bathtub. - The basement floor comprises a cellar and the central heating area. All the bedrooms benefit from a fabulous view of the property’s garden and the surrounding hills. The house, which was fully restored between 1995 and the early 2000s, is in good condition. The property’s land, partly used as a garden, extends for 1.5 hectares and in addition to complete privacy, offers an incredible view of the hills and the surrounding vineyards. The property, due to its size and great location, would be ideal as a permanent residence or a holiday home for spending relaxing days surrounded by unspoilt nature.